On October 16, 2013, the second public meeting in the Gardiner East Environmental Assessment presented additional information and refinement of the options for dealing with the expressway’s segment between the Don River and Jarvis Street. Maintain the existing expressway with necessary repairs to make it sound for several decades’ more service. Replace the expressway on a new structure either above or below ground. Improve the existing expressway by selective reconstruction to open up space under the road deck. Remove the expressway and create an at-grade boulevard. An underground alignment 1km long transitioning to/from existing elevated structured at the Don and at Jarvis. An elevated alignment over the rail corridor. A surface alignment on a berm abutting the south side of the rail corridor. If we were contemplating a tunnel across all of downtown, the argument about ramps and O-D patterns would be valid, but in this case, from the point of view of such a tunnel, most traffic is “through” traffic. 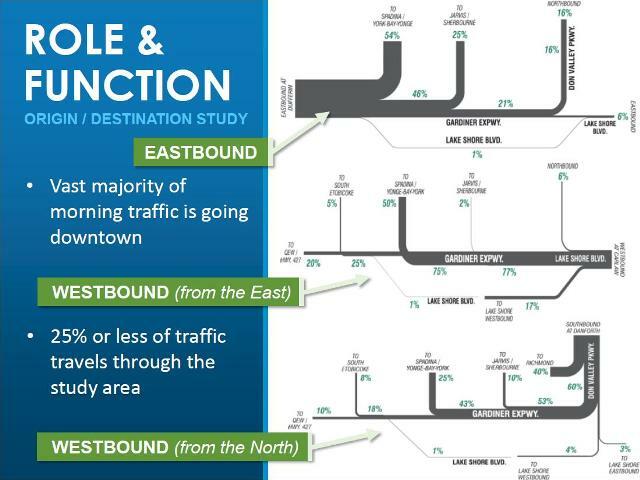 Only 10% of traffic that would enter a tunnel westbound at the Don leaves at Jarvis, and even this would be served if an off-ramp were incorporated in the transition from tunnel to elevated. Similar arguments apply to the other O-D maps above. The real problems with a tunnel are its cost and the barrier effect created by ramps linking the tunnel to the elevated structures at the Don and at Jarvis Street. The schemes involving the rail corridor have both been dropped because they cannot be fitted into the space available. In the case of an elevated, there is no room for the support structures needed (not to mention access ramps), and in the case of the berm, the area is reserved for future expansion of rail operations. A far more important issue hinted at by the presentation but not explored in detail is the wider context of transportation into the core area.